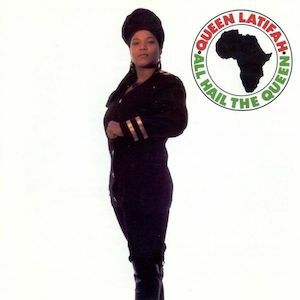 This marks Queen Latifah's debut album, the creatively titled "All Hail The Queen". To open the album, we got a very good, upbeat song, which would've made you dance, no doubt. Latifah was feeling it here, in true party mode and riding 45 King's beat so nicely. The first word that describes this song is creative, and usually you'll find De La Soul not too far behind when something creative is present. On top of the creativity, it's another song that makes you wanna dance, and it's not out of place at all here. The "House" style was in full effect here, and trust me this very style would come full circle as the 1990s began. Latifah makes it clear that you don't have to be a man to lay down the law, lol. She makes her presence felt in the hip hop way. "This mic in my hand, I'm RULING!" "Don't try to play me out, cause I ain't the one!" Those lines above are two of the Latifah's most memorable, coming courtesy of this nice song. This one was about 1 minute or so too long, even with its semi reggae styled theme. It's ok for the most part, nothing more. Oh man, do I even have to say how excellent this song is? Apply titled, yes indeed, and a true anthem for the ladies, not just for Black women, but women of all races. When is the last time a song like this graced hip hop? It's been a LONG time, and you won't ever see Nicki Minaj or any female artists like her make a song like this. Classic. 45 King, in addition to being behind the boards, steps on the mic with the Queen for this one. His verse wasn't bad at all, but Latifah more than held her own her with such a commanding, lady like presence. It was interesting to hear another female MC, along with MC Lyte and Salt N Pepa at the time, claiming their superiority (and confidence) on the mic. Latifah does that here and then some. Latifah links up with BDP's own KRS-One for this banger. You can listen to this and tell the beat had Latifah in a "boogie down" state of mind and it worked. She's a queen (of royal badness) and a princess at the same time. This was another dope jam where her presence on the mic (complete with a nice, reggae flavored hook) made it work. Naw, you can't turn this sista inside out. Fast paced, decent song. I liked this remix a little more than the original version, although both are equally dope and gets the job done in terms of making you dance. This remix was not that different from the original, outside of being a few more minutes longer. Still very good though. This doesn't pack the same punch as the original, but again it's good. Latifah's debut was (and still is) a VERY good album, a fitting debut. It's a good thing her career went as far as it did (which will definitely be touched on as we enter the 1990s), because she was so talented (with a style that everyone could love), definitely an album that showed she was indeed here to stay. Also, while "Ladies First", "Wrath Of My Madness", and "Come Into My House" (just to name three) are classics and this album was listed on The Source's Top 100 Best Rap Albums, I feel it was slightly forgotten, likely because of the timing of its release. Overall, this was a job well done. Thank you Ms. Latifah!! !